I've spent a bit of time over the past week or so with a new math product intended for kids in preschool through early elementary ages. Trina, my kindergartner, has been my test subject. Richard (2nd grade) thought he was far too mature for this. He will, however, be joining in. Just not at the beginning. 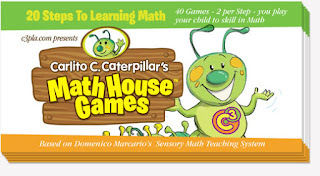 Carlito C. Caterpillar's Math House Games is a set of 8" x 4" cards -- thirty of them -- on a ring. Twenty of the cards have math games, with a version of the same concept on each side. That means there are forty math games in all. The final games involve multiplication and division, so this definitely is something that can take you well past "preschool" math. The cards contain the instructions for playing the games, and a list of "stuff" you will need. That stuff might include socks, fruit, chickpeas, notepaper.... or it might include the special manipulatives that you can download. I was disappointed that the link to the downloads was incorrect. However, it was pretty easy to find on the website. From the home page, you click through to downloads, and scrolling down to the manipulative pages, which are available as pdf files by stage. The first cards are introductory in nature, talking about the myths about teaching math to young kids, for instance. I disagreed with a couple points made, but overall, I thought this was an excellent discussion, particularly good for parents who are just starting off with their oldest child. Trina and I are having a lot of fun with these games, and I will continue to use these for a lot of her kindergarten math. I don't tend to believe in "formal" math at this age anyway, and I am impressed with the approach used here. Would you like to win a copy? I have one to give away. I'm trying something new with Rafflecopter, so I'd love feedback on this as well! And...for the Facebook option for me, if you are friends with me on Facebook already, go ahead and click "I did this." If you aren't, you can find my page here, and friend request me, then click "I did this." It wouldn't be any fun if I did this all right the first time! I would use this with my 6 year old son. This would be great to have!!! Thanks for the giveaway! I'd use this with Lauren. Or better yet, I'd enlist an older sibling to do it with her. What a neat product! It sounds like a great hands-on way to teach math. My 7 and 12 year olds might play this together. I'd definitely be using this with my K/1st grader and my 2nd grader who needs help with math. Samantha would be the user. Like Cristi I would enlist helpers to play the games with her. My 6-year-old would be the primary user, though I can see the older kids benefiting at well. Math is a special challenge in our house. Thanks for the giveaway! I would use this with my Kindergartener Levi! This looks like something I could use with my 6-year-old! Would love this for my 7 and 6 year olds. We desperately need math for my youngest. This would be great! This would eventually be used wiht both of my boys as we begin our journey in homeschooling. My kids are in 2nd and 3rd grade. They are required to study math at least 10 minutes every day. We really struggle with finding ways to keep it interesting. This would really stir things up a bit! I would use this with both of my sons! I have three boys under 5, so this would get a lot of use at our house! My granddaughter would use this. My 5 and 9 year olds would use this. Thanks for the giveaway. I would like to use this with my son who is in Pre-K this year. My husband teaches first grade - he could use this with his students!